The folks at Chimney Rock also shared with us that on May 8, the Third Annual Lure of the Dragons boat race will take place on Lake Lure, which is part of the Hickory Nut Gorge area that envelops Chimney Rock Park. (You can see a beautiful view of Lake Lure from the Chimney.) This yearly dragon boat race and festival raises money for children’s charities. Learn more at www.lureofthedragons.org. The Naturalist Series continues May 15, with a wildflower walk through the Park. The walk will take place on several trails at the Park and will be about three miles in length, with stops along the way to view and learn about the diverse plant life at Chimney Rock Park. Over 700 species of plants have been recorded at the Park. That’s what we would definitely call diversity! You do need to register online for this event so visit the Chimney Rock Park website for details. On May 23, the Simon Says Bird Walk Series will take place with Breeding Birds. Simon Thompson, the Park’s ornithologist, will show you various birds, including more than one species of woodpecker. Additionally, you’ll be able to learn about, hear and maybe see the nests of Yellow-throated and Red-eyed Virios (a chatty species of bird that also frequents our orchard this time of year). 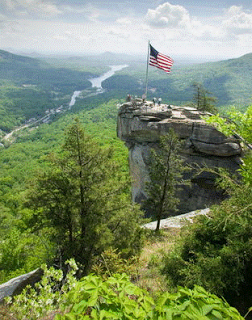 This is another event for which you’ll need to register online; visit the Chimney Rock Park website for details. This entry was posted in Uncategorized and tagged outdoors, Spring by Inn on Mill Creek. Bookmark the permalink.